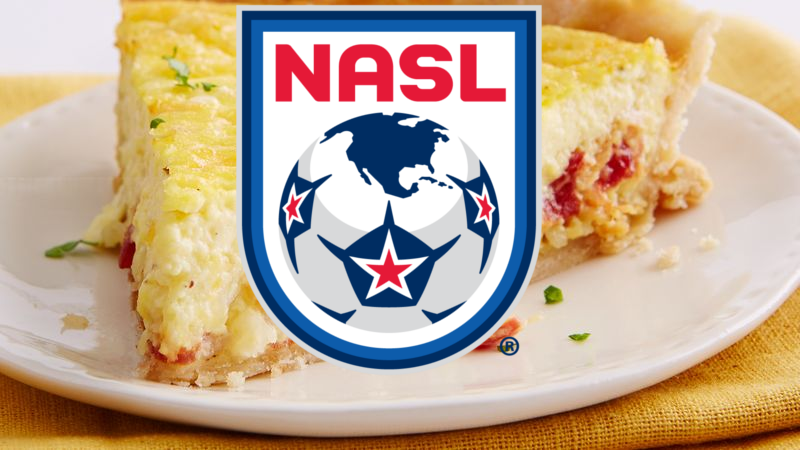 NEW YORK - David Howard, a pipefitter and part-time, unpaid, soccer blogger, stated that he uncovered a lovely quiche lorraine recipe hidden on page 433 of the NASL Anti-trust lawsuit that will blow this whole lawsuit apart. PROMOTION AND RELEGATION FOR QUICHE. "Some amazing information in the NASL lawsuit documents," tweeted Howard from his account @SoccerExpertNYC. "There's a declaration about MLS trying to buy and kill the Cosmos brand, there's information about the relationship between the NASL and the USL, and there's a lovely Quiche Lorraine recipe hidden on page 433." Reportedly, Howard stated that while he was first interested by the idea of MLS attempting to purchase and kill the Cosmos brand, he was more intrigued by the preparation that involved green onions over bacon, and then more bacon which really gives a lovely taste and texture to the Quiche. "It's a delicious quiche, it really is," tweeted Howard to his account shortly after eating the NASL delight. "I just wish that this quiche got a chance on the big stage of American foods and wasn't being kept down by THE GLOBAL CONSPIRACY PERPETRATED BY SUM AND USSF." The Nutmeg News will have more on this as the quiche files a lawsuit against the USSF for not sanctioning it as a Division 1 food.